“Victory Lane Camp is writing a new story. It’s a story of victory,” founder Brett Fischer shared as he concluded another enjoyable evening of entertainment at this year’s Talent Night. Stories of victory were shared throughout the evening by both serving families and victory families that have been involved with VLC over the years. The first performer of the evening was Luke Schlink. Before his round of impressive magic tricks, Luke’s dad Jimmy and sister Lexi spoke about Luke and what Luke had taught them. After being born at 27 weeks and diagnosed with cerebral palsy, Luke has grown, not just in stature, but also in his impact on those around him. “Luke helped me to realize we should include everyone and has taught me how to love,” expressed Lexi. “He makes me appreciate the finer things in life,” Jimmy shared. The performers to follow, Noah and Landon Mace, were brothers both diagnosed with autism spectrum disorder at young ages. The audience laughed along with Noah and Landon as they told jokes with each other and offered a rendition of “Welcome to the Landon Show.” Prior to their performance, their parents, Monte and Natalee, shared about the life lessons they have learned from their sons. When Alex Mills was diagnosed with cerebral palsy, his dad Jaime realized, “no one teaches you how to raise a special needs child. He has taught us, it doesn’t hurt to try.” And try is what Alex continues to do as he and his parents performed the song “Here I Go Again,” made famous by the band Whitesnake. 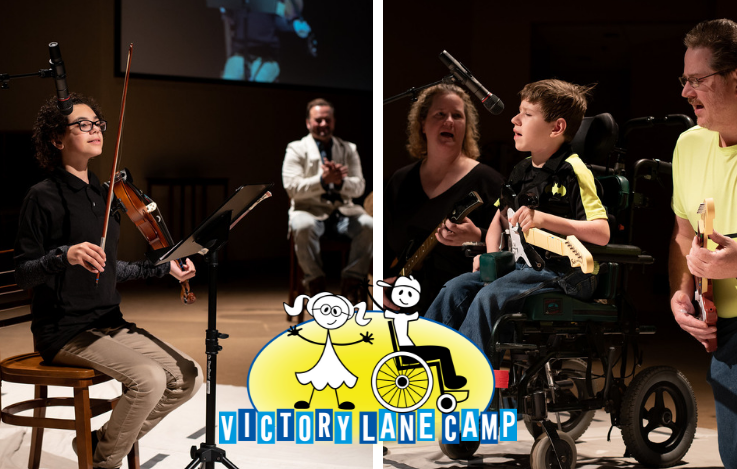 This year, Victory Lane Camp presented the Victory Award to Mount Pleasant Christian Church of Greenwood for their work with Tim Tebow’s “Night to Shine.” This church family also sent meal missionaries to help with Victory Lane Camp summer sessions and provided financial support. This award is given to organizations that are exemplifying Christ’s excellence, engagement, and enthusiasm as they serve families of children with special needs. As Victory Lane Camp continues to grow and thrive, generous support continues to be needed. A charitable donor has agreed to match all new donations made during the month of November, up to $5,000. Consider donating and helping VLC share community and write a new story. Share in the victories by donating here: www.VictoryLaneCamp.org/give.